Eunamus will here discuss research performed by partners and associates in two of the project’s research strands. 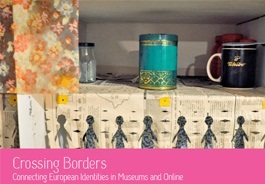 Fieldwork in eleven European cityscapes, studies of distributed national museumscapes in Norway, Britain, Sweden and Italy a well as two studies of museum-like representations on the Web are summed up in Eunamus report No 2: Crossing Borders: Connecting European Identities in Museums and Online. This research strand takes contextual knowledge from Eunamus other areas of studies and relates it to visitor experiences. The aim is to explore the understanding and use of national museums by the public.It also aims to map public understanding of the nation and Europe in the present and how visitors use the past to construct national and European identities. The last week of February 2011, the research team gathered at the University of Tartu in Estonia for an intensive workshop. The aim was to discuss the findings from the pilot studies that took place at the National Museum of Scotland in Edinburgh and the Byzantine and Christian Museum in Athens. Furthermore, to exchange ideas and views, to finalise methodology issues and finally to decide on the case studies. 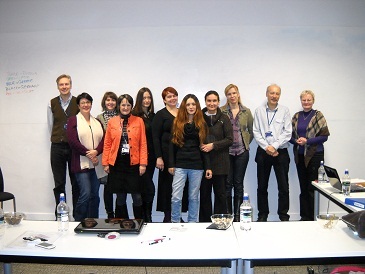 On November 10th-11th 2011, a second workshop took place in the School of Museum Studies at the University of Leicester. The workshop was organized by the Research Centre for Museum and Galleries, which has been working on this research strand. In the intensive but very productive two days, the researchers from three universities – the University of the Aegean, the RCMG of the University of Leicester and the University of Tartu – discussed the qualitative data collected during the previous period in six museums across Europe: the National Museum of Scotland, the National Museum of Ireland, the National Museum of Estonia, the Open-Air Museum of Latvia, the National Historical Museum of Athens and the Deutches Historisches Museum in Berlin. After a brief presentation of the Museums and the context of the data collection, the workshop was structured around the themes that have been identified as important during the previous stages of the planning of the research, but also during the collection and first analysis of the data: How people use museums for the construction of their identity; How people use museum objects and narratives; What the visitors think is missing from national museums; Ideas of Europe; Minority groups’ views and so on, were among the key questions. The analysis of the data collected through interviews and focus groups will be completed in 2012, by the RCMG, while the data collected through questionnaires will be analysed by the team of the University of the Aegean. 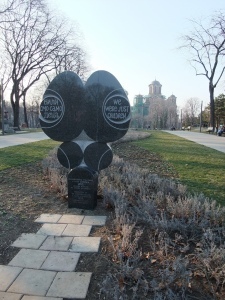 The Balkan wars in the 1990’s are ever-present for a visitor to Balkan. Mostly as silences. An unspoken mix of allegations, guilt and suffering is hard to give a format in ordinary cultural institutions and polite society. In Europe the Second World War and especially the Holocaust has been the absolute historical ground Zero, a pivotal point never to be returned to, an indisputable motivation for democratic cooperation – And yet Srebrenica occurred, Sarajevo was besieged and Belgrade bombed. Can this pass without being spoken, dealt with? Of course not – but how, by whom and when? 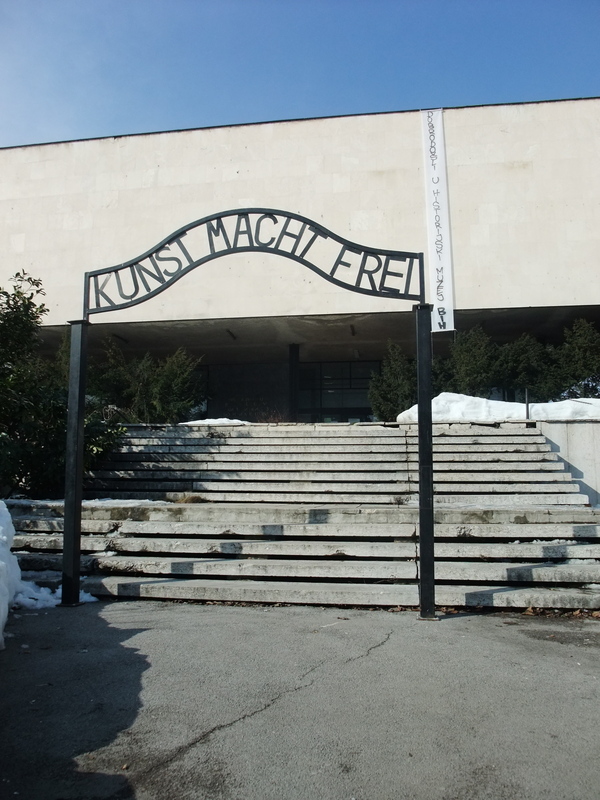 Terrible films and documentaries are available, but I have looked upon how these topics are dealt and not dealt with at some public institutions, national museums in Belgrade and Sarajevo. Mostly the topic is not touched upon at all. The ground is still to dangerous, full of possible complications, unsolved matters, geopolitical issues. Occasionally and in certain institutions there are distinct statements. Certainly there is a consensus on the fact that there has been violence. There is likewise a strong parallel consensus that both Serbia and Bosnia are firmly rooted as medieval states that awaited liberation. Here consensus ends and this is perhaps a clear sign that there is a long road to go where cultural institutions needs to be involved in negotiating process of truth and reconciliation. As for now these have only rarely resulted in visible forms of cooperation. They are still in the process of defending and accusing but sometimes also planning exchange and joint ventures on secure grounds of displaying for example every-day life in Ottoman and Habsburg days. 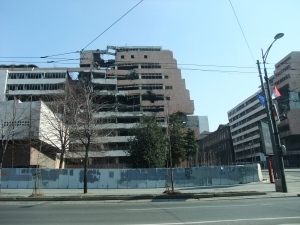 In Serbia bombed ministerial buildings are kept as an open wound to show what is named “NATO aggression”. A new monument over two killed children in a popular park gives a face to these losses. In the Military museum a new part first demonstrates Serbian contribution to UN missions, and then goes on to tell the history of in their view illegal separatism in Croatia, weapons with Serbian blood on them, captured NATO equipment and again evidence of the “aggression” ends the exhibition which started with the dawn of Slav people coming to Balkan in pre-history. In Sarajevo the National History museum is adequately half in ruins and tells a strong story of suffering during the siege. But the institution has a hard time to survive – people understandably rather join Caffé Tito on stairs below for music and a drink. The national cultural institutions are in both states in great despair: many are closed. A lack of funds is the formal motivation, but I would say that other reasons are as important: the insecurity of which future to pursue makes the question of the past open and dangerous. To close ties between culture and politics means that shifts in political powers generates new directors and policies. This makes cultural institutions lose their credibility and the long-term perspective needed for these. Instead NGOs and festivals fill the void with lots of activities supported also by Swedish efforts. I think a more distanced and explicitly reflective relation to the war is only possible when a non-fighting generation is in need of formulating what happened, but trauma also needs to be dealt without enhancing and repeating hostility. If old state-run institutions that call themselves national museums do not do that, NGO’s once again have to take the role civic national movements once did in the 19th century. They need to invent and represent how they see the valuable part of their heritage in the face of their aspirations for the future. Maybe they already are gathering forces in communities – I have only missed them because of my focus are on the old institutions? It would be a pity if old investments were not to be re-used again. The capital invested is to large not to be used for creating also new visions and communities. Piece by piece this is done. 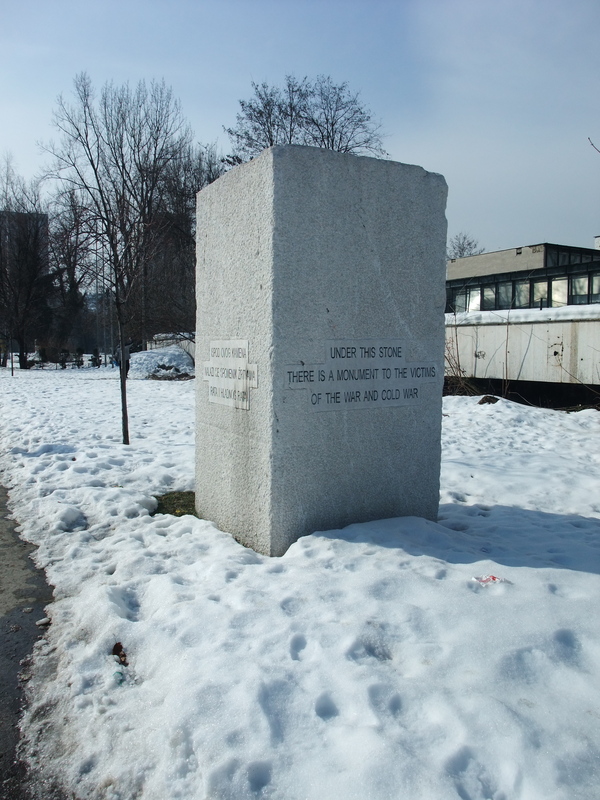 See the monument over the dreary meat tin that made Sarajevo survive, the Ironic and nostalgic Tito Caffe, the monument that says it covers a monument and the portal that says Kunst Macht Frei. All this happens in-between the National museum and the National Historical museums. And with a little help from my friends I learn how to read this dialogue in the public space created not in but around the old institutions. Further reading from Peter Aronsson & Gabriella Elgenius, (eds.). 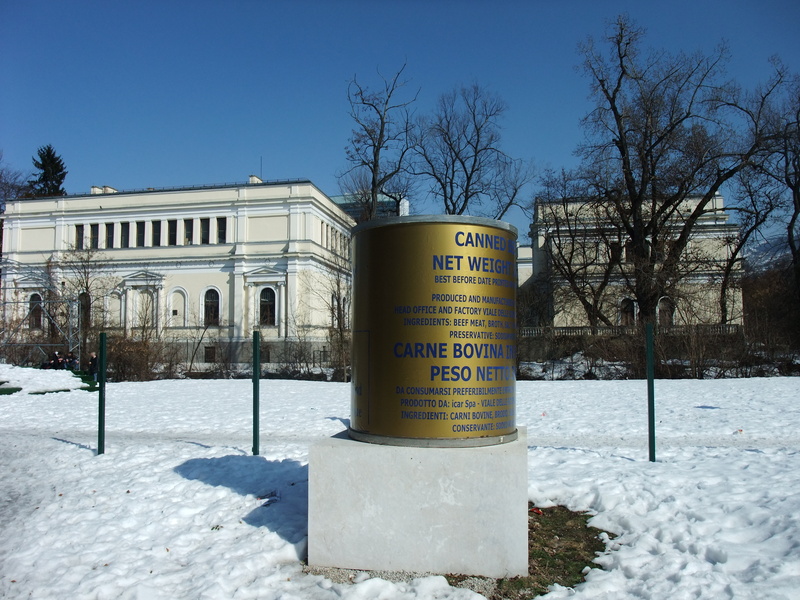 Building National Museums in Europe 1750–2010. Conference proceedings from EuNaMus, European National Museums: Identity Politics, the Uses of the Past and the European Citizen, Bologna 28-30 April 2011. (Linköping: LiU E-Press, 2011). 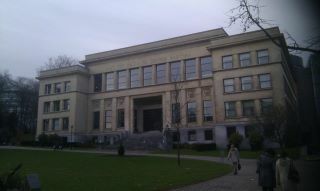 This post reports from the panels on Eunamus research and the creation of new history museums held at the Royal Museums of Art and History in Brussels, the Cinquantenaire Museum, the 25th of January. 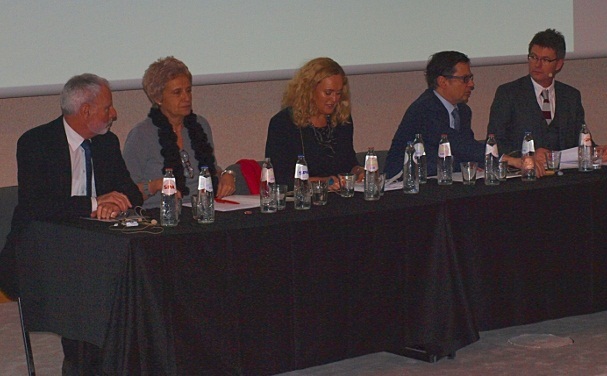 The panels were co-organised by Eunamus and the House of European History. 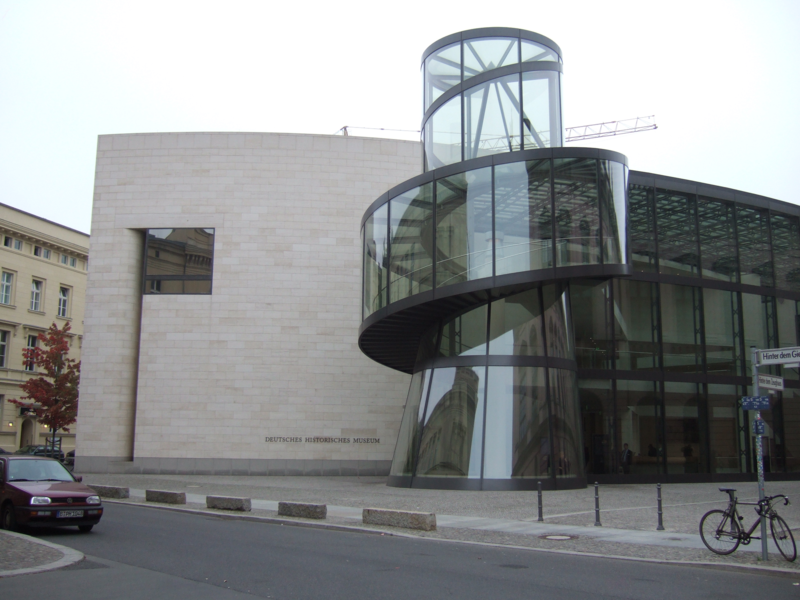 Museums have a role to play in the European unification. That was the message from Professor Chrysoula Paliadeli who in her role as a member of the European Parliament was invited to comment on the policy relevance of Eunamus research. 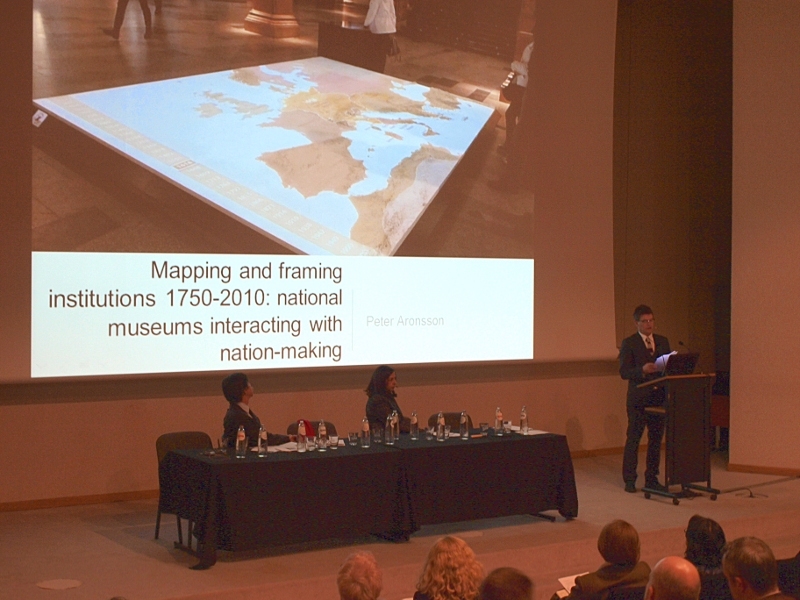 In his presentation, project coordinator Peter Aronsson pointed to the ways in which museums form a necessary part of a ‘cultural constitution’ supporting both a connective tissue of culture and underpinning the communicative spaces that are so crucial for democracy. Dominique Poulot emphasized how many national museums today strive to go beyond the national, to become agents of cultural diplomacy or to produce new representations of Europe in temporary exhibitions. Picking up threads from both presentations, Chrysoula Paliadeli, stressed the importance of culture in times of economic crisis. She also raised concerns about national separatism and suggested that museums may support the European idea by collaborations, loans and exchanges. In his talk, Martin Schaerer from ICOM provided a bridge to the second panel: Entering the mine-fields – the creation of new history museums in Europe. New history museums are on the top of the museum policy agenda in many countries in contemporary Europe. They are created by politicians, implemented by academics and made for the public. It seems to be a need for the reconstruction of identities that sparks these initiatives. It is not only conservative, or right wing, politicians who support them, rather opponents and proponents are found in several political camps, from left to right, and among both liberals and republicans. How do then academics respond to the roles and tasks given them? The panellists seemed to agree upon the necessity of destabilizing simple and one-dimensional national identities by creating exhibitions that displays the ways in which national and European histories are constructed rather than given. The German case has proven successful, but time will tell how audiences will react to the other initiatives. Rosmarie Beier-de Haan from the Deutsches Historisches Museum opened the discussions by highlighting how she and her colleagues had started with the question: who are the Germans today? Robert Kostro, from the National Museum for Polish History talked about how they are moulding a new narrative of freedom and democracy to support Polish identity. He also underlined that when handing over the task of creating a new museum to academics, politicians do not always get want they want. Similarly, Charles Personnaz from The Maison de l’Histoire de France advocated the freedom of historians. This French initiative has sparked a sometimes fierce public debate on the possibility of producing a national history. What about the regions and the diversity of cultures within the contemporary state? Who are the French citizens and what is the role of history in the construction of a shared space for citizenry? In this situation, politicians may propose a museum, but they cannot dictate historical narratives. The task given to Taja Vovk-van Gaal at the House of the European History, initiated by the European Parliament, is different. She coordinates academics from 18 countries and this museum is created in interactions between the staff. It is not about exhibiting a European mosaic of countries, but about displaying a reflexive European history, also including dark chapters such as colonialism and armed conflicts. The public debates surrounding the House of European History concern the economic legitimacy of the initiative, rather than the content. This bias may be interpreted as a consequence of the current economic crisis, but it may also be interpreted as a lack of public interest in a common European history, perhaps also reflecting the need for a shared space to discuss cultural issues, and to enhance legitimacy for the European project. The panels were moderated by Gabriella Elgenius, University of Oxford and Chantal Kesteloot, Centre for Historical Research and Documentation on War and Contemporary Society, Brussels. There are plans to publish the talks later this year. Eric Grubel delivered the speech prepared by Professor Michel Draguet, General Director a.i. of the Royal Museums of Art and History. Alexandra Kalogirou replaced Xavier Troussard to represent the European Commission’s Directorate General Education and Culture. 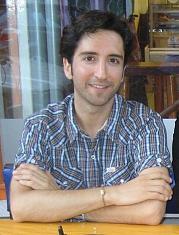 Octavio Quintana Trias represented the European Commission’s Directorate General Research and Innovation. Picture of the panelists: Andrew Sawyer, the Deutsches Historisches Museum: Peter Aronsson, and the future House of European History, Bodil Axelsson. Pictures below: Andrew Sawyer. 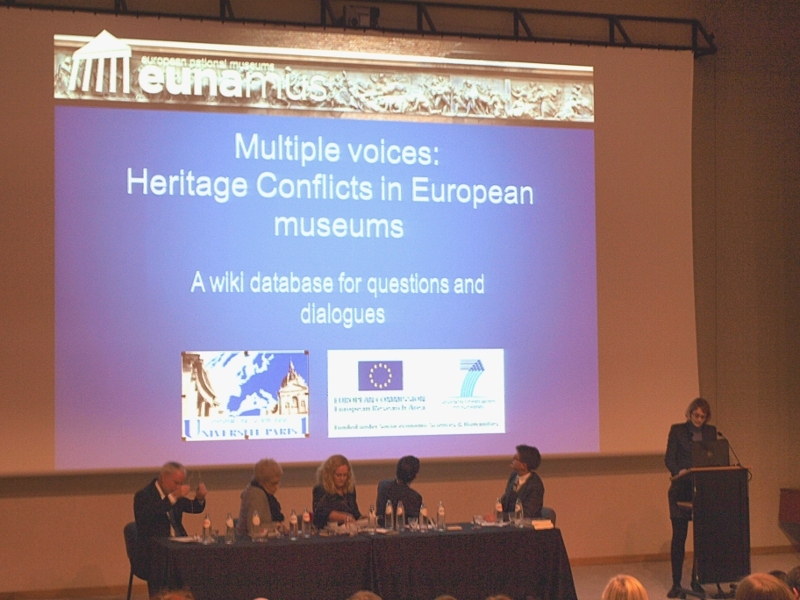 Felicity Bodenstein launches Eunamus wiki on heritage conflicts. Creativity and diversity, these two buzzwords are at the heart of the new EU programme dedicated to the cultural and creative sectors, and proposed by the European Commission on 23 November 2011. During the next year the proposal Creative Europe, will be discussed among the Council of EU Ministers and the European Parliament before its possible realisation. It is an important programme as it is connected to the Multiannual Financial Framework for 2014-2020, and thus decides the roles for culture for a considerable time frame. The new programme differs from its forerunners due to the fact that it joins the previously separated areas media and culture. Digitalisation and the increased role of the cultural and creative sectors of the European economy are bringing the two areas together. When Vladimír Šucha introduced the programme to the cultural sector in Sweden the message was that the economy alone cannot bring together the European member states. Culture was introduced as the way forward out of the monetary crisis at an event significantly coloured by the fact that in Brussels the leaders of the European member states discussed how to solve the crises for the single currency and how to keep trust among the member states. Šucha, who is the Director for Culture, Multilingualism and Communication, at the Directorate General for Education and Culture of the European Commission, stressed that culture cannot be a mere decoration. Rather, the sector is an economic asset to be used in education as well as in social and industrial innovation. View photostream from the event Europaprojektets framtid organised by Intercult et al. A European take on Cosmopolitanism With its focus on developing capacities among artists and cultural professionals to work across borders and financial instruments to support transnational cultural activities of small companies within and outside of the EU, the programme could be seen as expression of a European take on Cosmopolitanism. Šucha himself warned for locking culture in regional and national boxes. His arguments on extended transnational collaboration were further radicalized by Chris Torch, one of the moderators at the event and in the context of European cultural policy a well-known proponent of cultural diversity and multicultural mélange also within nations. National Museum initiatives But where does this suggested step towards increased economically based cosmopolitanism, which is now complementing EU:s motto “united in difference”, leave national museums, established markers of national identities? As a matter of fact, museums are already building capacities for creativity, innovation and transnational collaboration. NEMO, the Network of European Museum Organisations, provides a database with links to projects on Innovation and Creativity in Museums, Intercultural Dialogue and lifelong learning in museums, and Digitisation in European Museums. Transnational collaboration is also built into the topic of collection mobility, which has been on the agenda for about ten years now. This topic has generated working groups, guidelines and an impressive volume with editors from several European museums. Another forward-looking project is LEM, the learning museums network project. The LEM project has 23 partners from 17 European countries and the US. It is funded under the EU Lifelong Learning Programme Grundtvig. The Mobility Scheme is one of many activities this network coordinates. Five of the LEM partners have agreed to host colleagues for job-shadowing or study visits. It is clear that museum networks as well as the European Union already have acted in the directions proposed in the new Creative Europe Programme. The question is though if the new programme relates to museums at all with its emphasis on access to finance for small under-capitalised enterprises. EuNaMus will closely follow the discussions on the reception of the Creative Europe Programme and return to the subject in 2012. José María Lanzarote Guiral reports from the second international conference on “Great historical narratives in Europe’s national museums”, held in the Louvre and Institut national d’histoire de l’art in Paris from the 25th to the 26 of November. As at the previous conference in June , a selection of speakers coming from all over Europe and beyond gathered in Paris to debate on key issues for the development of Eunamus research strand “Uses of the Past, narrating the nation and negotiating conflict”. One major question, “To what extent can national museums be considered as authors of great historical narratives?” had enticed more than 25 researchers and museum professionals to respond the call. Papers in both English and French spanned from the Prado to the British Museum and from the Sami National Museum in Norway to the new Acropolis Museum in Greece. Some of the most relevant European museums were analysed from different perspectives; several papers discussed the ways in which museums historically have formed collections or reinterpreted existing ones in order to construct national master narratives. Other papers highlighted how museums strive to respond to the questions posed by increasingly transnational European societies. The discussions were started by presentations given by keynote speakers. María Bolaños opened the first session with an overview of the creation of national museums in Spain. A long-term historical perspective was also chosen by Ellinoor Bergvelt to analyse the history of Dutch national museums. Finally, the extra-European dimension was considered in the opening of the third session by Alexandra Loumpet-Galitzine, who discussed the creation of national museums in several French-speaking African countries. Narratives supporting the 19th century nationmaking The visualisation of the national narrative in museums promoted by the 19th century nation-state in formation was analysed by Eugenia Afinoguenova on the Prado Museum, Miklós Székely on the Hungarian National Museum, and Aleksandar Ignatović on the National Museum of Belgrade in this case in the Interwar Period. Diachronic studies of museums Diachronic studies were provided by Frank Matthias Kammel on the evolution of the Germanisches Nationalmuseum in Nuremberg, Amy Clarke on the transformation of the Royal Museum of Scotland to National Museum, or by Gabor Ébli, who analysed, from a comparative perspective, the making of national galleries in Central and Eastern Europe. Adding new elements to the debate, Costanze Breuer reflected on the intersecting of the national and the great men narrative while considering Goethe’s House in Weimar. Controlled museum spaces Some other presentations discussed the relationship between museum creation and display in regimes marked by strong ideological control, such as Melania Savino on the archaeological Museums in the Turkish Republic or Gabriella Petkova-Campbell on the impact of communism in Bulgarian national museums. The nation’s accomplishments The role of the museum in visualising the accomplishments of the nation was the topic of Annie Malama, on the Greek Museum of Modern art, or Cristina Ntaflou’s on the newly opened Museum of the Acropolis. Challenges of postmodernity and contested authority How museums deal with the challenges of the postmodernity was the subject of the presentations by Tiffany Jenkins on “inverting the nation” at the British museum, Martin Sundberg on Stockholm’s Moderna Museet, and Pascale Meyer on the Swiss National Museum in Zurich. Contested authority related to anthropological artefacts was a key issue in several presentations, such as the one by Hilde Nielssen and Sigrid Lien on the Sami National Museum in Norway or the one by Leila Koivunen on the National Museum of Finland. In a different key, Maria Anna Bertolino considered local museums of ethnography in Northern Italy. Considering also temporary exhibitions Not only national museums but also the visualisation of master narratives in national and international exhibitions were discussed by some speakers, such as for instance Giovanni Arena, who reflected on the 1941 colonial exhibition organised by the Fascist regime in Naples, and Michela Passini’s on the Jeu de Paume exhibitions in Paris during the Interwar Period. In turn, Nathalie Cerezales reflected on the subtle interplay of the religious and the aesthetic message in the exhibitions of sacred art in the 1990s in Spain. 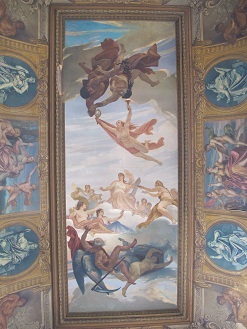 Finally, some other topics related to the means of displaying and protecting collections in the national museums were considered, for instance, by Sylvain Cordier, who spoke on the role of furniture in the Museum of French History created by King Louis Phillipe in Versailles, or Arnaud Bertinet on the safekeeping of French works of art during French-Prussian War in 1873. In the last presentation, Caroline Caillet dealt with the negotiations for restitution of artworks between Alger and France after the decolonisation, opening the debate on heritage restitution that will be pursued further in the next conference, in Brussels in January 26-27th. Eunamus’ partner University Paris 1 Panthéon Sorbonne, led by Prof. Dominique Poulot, organised the conference. This conference expands the knowledge on the ways in which museums adapt their explicit narratives to changing social and political situations. It is organised by Dominique Poulot and Felicity Bodenstein and takes place in Paris 25-26 November, as this post is published. On the conference, a row of papers explore the ways in which narratives in national museums link to ruling monarchs, state ideologies, or (post)colonial relations. Several papers highlight the ways in which museums alter collections, or reinterpret existing collections, to modify their messages, when political regimes changes. Other papers highlight how museums adjust to more subtle changes in public opinions, in ways of for example handling imperial pasts. Read all the abstracts here and the full programme here. Where is it? Laurajane Smith and Kylie Message, Australia National University, are the best guides you could imagine for an understanding of the dynamics of the Australian National Museum since it opened in 2001. They make me understand how central and adjustable the exhibitions are to changes in contemporary politics. The short history of the museum shows shadows of the History Wars of Australia. Exhibitions moves from focusing people and stories to objects, territory and chronology. Colonialism becomes hidden in general migration. It is Remembrance Day 11 November, and at 11 trumpets sounds and a silent minute is held for the sacrifice of war. The war memorial placed in line with both the old and the new parliament create an axis of memory and politics like the Mall in Washington, flanked by National Gallery, National Library, the High Court. At the War memorial the names of the fallen soldiers are honored and the statement that Australia was borne on the shores of Gallipoli is transferred to new generations. A new heritage is constituted by the Old parliament that turned into a museum of democracy and the site of the Aboriginal protest tent camp from the 1970’s that now is protected as a heritage site. Altogether this forms a functional national museum that goes beyond the ANM, contextualize it, and highlights its political location. However you need a car to experience this in its totality, and perhaps a few more hours than I had to fully appreciate its complexity. It is a heritage alive – and today Barack Obama will pay his respect at the War Memorial and make his contribution to the history wars where pride over white achievements balance with regrets for atrocities against the Aboriginal inhabitants of the continent.